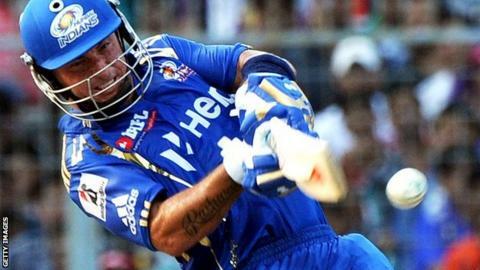 Herschelle Gibbs has been called many names in his time. He is a dashing opening batsman with an eye for a big score, or a Hansie Cronje crony who "dropped a World Cup". It depends on your perspective. But at this stage of his career, as a man in his late thirties who hasn't played for his country since 2010, it seems very clear why he still wields a bat in anger. "Cricketers are all entertainers," the 38-year-old tells BBC Sport. "Especially limited-overs, where you've got to try and put on a show." Gibbs is a dynamic, six-smashing, hard-running, batting globe-trotter, careering around the international Twenty20 scene, opening for franchises from West Indies to Australia and getting rewarded handsomely. "I play for the Perth Scorchers in Australia in the Big Bash," begins the Cape Town native who played 90 Tests for South Africa over 12 years. "I went to play for the Khulna Royals in Bangladesh in March and February of this year. Then I came home and played for the Cape Cobras, then on to the IPL [Indian Premier League] where I played for the Mumbai Indians. Then I jetted off to the UK and played for Durham Dynamos. "I've been on the road for five months non-stop, week-in week- out. The body needs a break as well as the mind." Gibbs took some time off before the Champions League and will then move on to the Big Bash, which ends in the second week of January. This hectic lifestyle is the new reality for an increasing number of players, as they chase the exposure and riches offered by a growing and lucrative T20 market. Competing franchises scrabble over the big-name signings, which in turn drives up prize money and salaries. Before you know it, big names are reappearing from the woodwork to participate. Matthew Hayden played in the inaugural Big Bash aged 39, and Muttiah Muralitharan and Adam Gilchrist, both 40, performed in the IPL earlier this year. Shane Warne, now 43, appeared in the IPL and Big Bash in 2011. Alongside those veterans who have returned and current Test players who take time out to play franchise Twenty20, a new breed of freelance cricketer has emerged - the likes of Dirk Nannes, Azhar Mahmood and Gibbs. They are unrestrained by central contracts, unburdened by the weight of an international career but equipped with the skills, physiques and mindsets that allow them to dazzle crowds, win matches and boost bank balances. It's a nomadic, challenging lifestyle, but one Gibbs says he relishes. "I've taken it upon myself to keep myself busy playing the T20 format as much as I can," he says. "If you have a bubbly, outgoing personality you tend to gel quite well. "Having been around for some time, I'm used to any conditions I face wherever I play. I've always wanted to try to put on a show and Twenty20 is the ideal stage to do that." Without the support offered by a contracted position with a national side - a fixture list, coaches, training facilities, physiotherapists - it is up to the freelancer to go it alone. For Gibbs, this presents a challenge rather than a problem. "My independence is not a burden or an issue for me. I watch what I eat. I enjoy my fitness. At home I have a few net sessions a week, just to stay in good nick," he explains. "If I'm free then I make myself available to play. I know what my schedule is like and when all the competitions around the world are supposed to start and finish. Logistically it can be done." For a young, talented cricketer, these opportunities might tempt them to ignore international cricket and focus on developing a Twenty20 career. West Indies spinner Sunil Narine, 24, signed for Kolkata Knight Riders for £450,000 earlier in the year and helped propel them to the IPL title. He was the second most economical bowler in the competition - all before making his Test debut. For Gibbs, becoming a professional T20 specialist could prove an attractive prospect for a developing, youthful cricketer. "Freelancing could be an option for a lot of aspiring international cricketers in the future, and maybe even those who don't play internationally," he says. "The amount of T20 that is played these days, I think some players can become very good T20 specialists. There are going to be a lot of opportunities and it's a real option for future players." And what of the future for a South African veteran, plying his trade in the twilight of his career, yet still opening the batting for teams from Bangalore to Brisbane? "I'd like to play for at least another three or four years," Gibbs says. "I'm 38 now. I've never believed age is an issue with me. I've been blessed with physique and speed. I have the body of a 28-year-old. "There's no reason why I can't play. I want to keep on going."